This giveaway is closed. Congratulations, Robin R.
Tonight until 6:30 PM EST tomorrow, I will give a Facebook Fan a coupon for a FREE single hamburger or sandwhich, american fries and soda pop from Johnny Rockets. Become a fan on Facebook and leave a comment BELOW this post on the Facebook wall page. This giveaway ends Friday, August 19 at 6:30 PM EST. Comments left below this post are not included in the giveaway. Wow – another great one from Athenos! 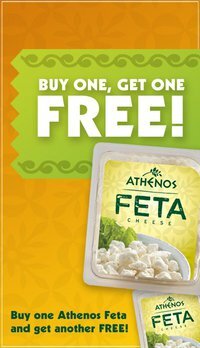 Head to their Facebook page and like them and you’ll be able to print a coupon for B1G1 Feta Cheese! (I still have my hummus coupons to use too.) Yay for Athenos! While you’re there, become a Fan of Frugal Coupon Living and receive constant updates on your Facebook homepage! If you haven’t requested your Neti Pot from their Facebook page, go HERE to request yours today! They are limiting this offer to one per household due to supply. I had so much fun reading about you guys in the surveys. It really helps to know my audience and shows me places I would like to improve in different areas. I have four short questions for you, that I was not able to get in the last survey. If you wouldn’t mind answering, that would help greatly. Head to Barbara’s Facebook page and like them to print a coupon for B1G1 Barbara’s Cereal! While you’re there, become a Fan of Frugal Coupon Living to receive constant updates on your Facebook homepage. Head to Cole’s Facebook page to get a $1 coupon off their new dinners! I have not seen these yet; but I wouldn’t be surprised if they go on sale soon since they’re so new. While you’re there, become a Fan of Frugal Coupon Living and you’ll get constant updates on your Facebook homepage! Head over to the Schick Intuition page on Facebook and like them to get a $4 coupon for the razor. You can also play their Keep it Smooth game for a chance at a $5,000 gift card to Target! While you’re there, become a Fan of Frugal Coupon Living and you’ll get constant updates to your Facebook homepage! Get a FREE sample of Gain Laundry Detergent on their Facebook page. Like them to get yours. While there, become a fan of Frugal Coupon Living!